From the beginning, the conservation and preservation of birds of prey in Iowa has been one of the primary objectives of the Iowa Falconer’s Association. We are, like other groups such as Pheasants Forever, Ducks Unlimited and the Wild Turkey Federation, hunters with a cause of conservation. As many people familiar with the environment today know, a great number of threats exist to natural habitats and the wildlife that lives in them. Hunters, perhaps more than any other group, have done much to secure habitat, and provide management support, for a broad spectrum of both game and non-game species. In the IFA we’re proud to be involved in building this kind of legacy. Noted below are a few of our projects and accomplishments. 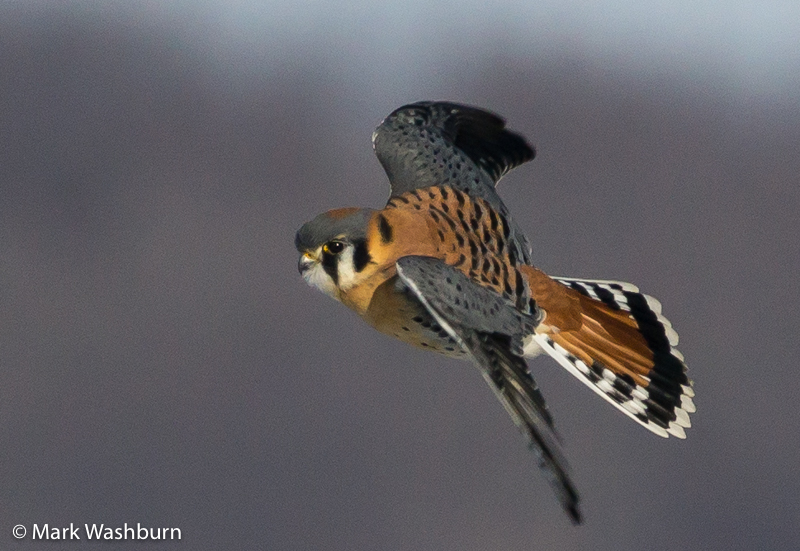 The Kestrel, North America’s smallest falcon, is a widespread inhabitant in Iowa. Being a prolific cavity nester in trees and buildings, the Kestrel hunts primarily small rodents and some insects. In the mid 1980’s, the Iowa Department of Natural Resources began the unique undertaking of erecting Kestrel nest boxes on road signs along Interstate 35, which cuts north to south through the middle of the state. At completion, the boxes ran all the way from the Minnesota to Missouri lines and numbered in the hundreds. This program became so successful that in 1988, the IFA began several projects in south eastern Iowa. Initially, IFA members constructed most of the boxes themselves. Later on, with the help of numerous scouting groups, the IFA moved from construction duties to field placement work. In two years, the IFA placed 117 boxes throughout southeast Iowa. Nesting success proved to be high in both the DNR and IFA programs and today, it’s a common site to see Kestrels hovering over fields or sitting on roadside telephone lines looking for a meal. There’s little question that the Kestrel programs would have continued, were it not for a more pressing and larger issue concerning an endangered species. 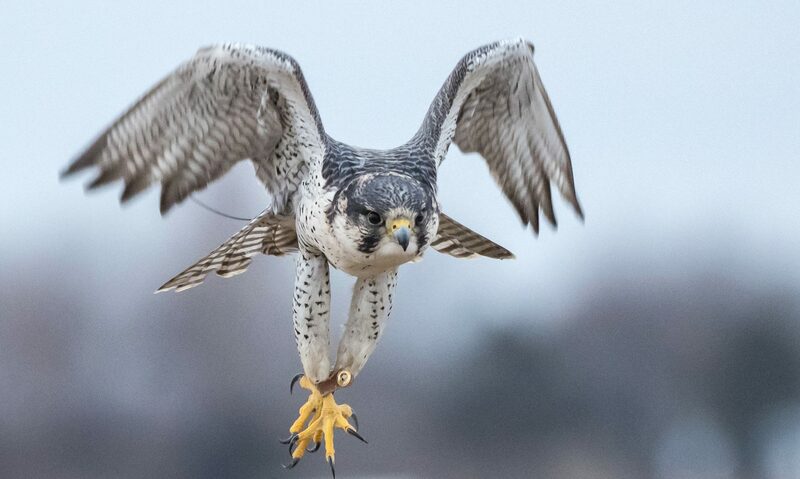 Beginning in 1989, work commenced to reintroduce the Peregrine falcon back to the Iowa skies, and it’s work that continues on with the IFA today. There is perhaps, no other bird of prey, that best symbolizes man’s complex relationship with the natural world, any better than the Peregrine falcon. For centuries, the peregrine has been the bird synonymous with falconry, with Kings and noblemen, with grace and powerful flight, and with man’s eventual neglect and misunderstanding surrounding his environment. It’s a history filled with fable and in more recent years, factual lessons to be remembered. There once was a time, dating back to the turn of the last century, when peregrine falcons nested and inhabited the limestone bluffs overlooking the Iowa Mississippi valley. It’s thought that some 50 to 60 pairs of falcons nested along the river in Minnesota, Wisconsin and Iowa, and some 350 to 400 pairs could be found eastward to the coast. In time, all this would change. In the summer of 1964, a single pair of falcons returned to their nesting site on a bluff near Lansing Iowa. The last of a dying race, they were the only falcons to be found nesting anywhere along the Mississippi river that year. In addition to being the last known peregrines in mid-continent, it now appears as if they may have been the last survivors of a subspecies found only in the eastern U.S.. When the pair failed to return in the spring of 1965, not a single wild peregrine could be found from the Mississippi to the Atlantic Ocean. The culprit it would seem, was not natural predation, or the encroachment of man on nesting sites…it turned out to be much more insideous. For several decades, beginning in the 1940’s, a wonderful new chemical had been used to help control insect populations. It proved highly effective…it was called DDT. DDT’s widespread use for over thirty years, while thought to be safe, was gradually building up in all areas of the environment. Rachel Carson’s book, Silent Spring, spoke of the negative impact on nontargeted species, and raised alarms that would eventually prove to be all too real. In certain areas of concentrated pesticide use, large flocks of robins, songbirds and other species were often found dead or dying. In the peregrine’s case, out and out poisoning, resulting in death, was not common. Yet, the effects on the falcon were widespread and dramatic. As the contaminants continued to be used, they eventually made their way up the food chain, from insects, to the birds that ate them, to the falcons that consumed the small birds. In the end, with the derived pesticides building up in their bodies, the falcons began to lay eggs that were becoming more thinshelled with each passing year. In time, literally no offspring were being produced due to egg breakage during incubation, and with that, the peregrine populations, in all parts of the world, would fall into decline. Although awareness came too late to save the eastern Anatum peregrine, concerned parties, which included biologists, environmentalists, and falconers, began to look for ways to save the peregrine worldwide, and if possible, reintroduce it to it’s historical habitat. The banning of DDT and other similar pesticides in the early 70’s helped to foster the hope that recovery would take place, yet, it was still far from a potential reality. Along with the ban, a noted ornithologist and falconer by the name of Tom Cade, began to consider the possibility of breeding the falcons in capivity and developing a method of reintroduction to the wild. In 1972, a handful of falconers had begun to successfully breed and rear young falcons in captivity, and using an age old falconry technique called “hacking” they found the way to release them back to the wild. With improved production in the years that followed, a widespread recovery program got underway and has, to date, led to the peregrine falcon’s removal from the federal endangered species list in 1999. On a national front, it is a success story without equal in the anals of environmental work. In the midwest, the program, headed by Dr. Patrick Redig, a falconer and Professor of Veterinary Medicine at the University of Minnesota, has brought the recovery to completion in all but a few states along the Mississippi. Iowa remains, as one of the states that has continued it’s recovery work into the new millineum. Beginning in 1989, the Iowa Department of Natural Resources targeted several cities to host falcon release programs. Cedar Rapids was home to falcons in 1989 and 1990. Des Moines would follow with a release in 1991 and Muscatine Iowa in 1992. In those three years, the IDNR, with the help of the IFA and other conservation organizations, released 40 young peregrines. At the time, the Muscatine project was unique in several ways. It was the first release of it’s kind to be conducted by two state wildlife agencies (Iowa and Illinois) and the first time that a government agency worked side by side in a co-coordination role with a private organization such as the Iowa Falconer’s Association. The IFA was the first state falconry organization in the U.S. to develop, coordinate and manage a full release project to completetion. It would not be the last contribution the IFA would make. In 1993, there was cause for celebration, as two pairs of falcons successfully reared young in Cedar Rapids and Des Moines. In Cedar Rapids, two chicks were hatched, but with the passing of a storm, one young falcon was found dead. In an effort to secure a successful nesting, Iowa falconers donated a chick from a member’s breeding project to be placed in the nest site with the remaining nestling. Within 50 days, both young had fledged and were successfully flying around the city. In the years following the 1992 release, the Iowa DNR and others took a wait and see attitude concerning the present population. The IFA continued work on monitoring nest sites, reading band numbers, conducting cliff surveys on the river, and building and placing peregrine nestboxes at various sites around the state. Then, in 1994, with no new pairs of falcons becoming established, a consortium of groups and individuals worked to form the Iowa Peregrine Falcon Recovery Team, which would once again spearehead the work to release more falcons in Iowa. Starting once again in 1996, IFA personel supported the recovery efforts by taking coordinating roles involving releases in Mason City, Louisa-Muscatine, Dubuque, and Effigy Mounds National Monument. With the help of countless individuals, state agencies and conservation groups, 73 falcons have been released since the creation of the IPFRT. This work has shown some initial promise with new pairs being established on the Mississippi flyway at power plants in Wisconsin and Iowa. Lansing Iowa, the last remaing historical site in 1964, is the first new river based nesting in the hawkeye state. It is hoped that with production and release work now taking place on the river itself, we will soon seen cliff nesting falcons once again in the midwest. Only time, and continued perseverence will tell the complete story, but hopes are high for a positive outcome in the coming decade. In all, since the midwest recovery began some 16 years ago, IFA members have directly contributed, through privately owned breeding projects and volunteerism, to the release of nearly 300 falcons. Some 50 nestboxes have been built and erected throughout the midwest by IFA personel, and countless hours of observation and research has led to vital information which has helped make the programs more successful. In addition, IFA members reach tens of thousands of people each year in educational programs concerning the peregrine and other raptors found in Iowa. It perhaps goes without saying that we are proud to be able to help in the worthwhile effort of bringing the peregrine back to Iowa…and to be certain, we remain dedicated to seeing this recovery through to it’s completion. 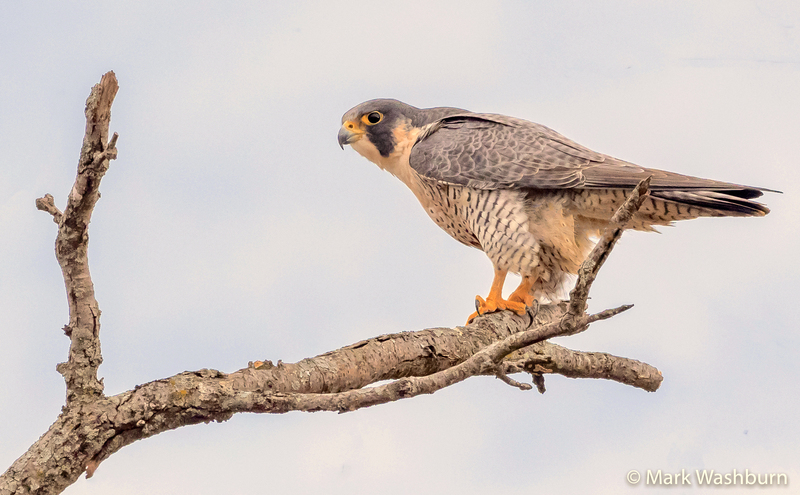 Editor’s Note: To get a current update on peregrine nesting activities in Iowa and the Mississippi river valley, be sure to check out Celebrating The Peregrines Return. Through the years, because of a falconer’s close association with raptors, it’s inevitable that people will call and request help with an injured bird. Whether it’s a redtailed hawk, or barred owl or a falcon of some kind, IFA members have always responded to help. Falconry, in itself, is not rehabilitation in the classic sense, and yet a number of falconry techniques have proven to be very useful in preparing a bird for release back to the wild. Conditioning techniques, as well as controlled flying programs all help to make the transistion back, a smooth and safe one. The Iowa Falconer’s Association received the Iowa Governor’s Volunteer Award for Conservation in 1990, 1993, and 1999.